Marion "Suge" Knight (left), seen with attorney Albert DeBlanc, pleaded no contest to voluntary manslaughter in Los Angeles Superior Court on Thursday. 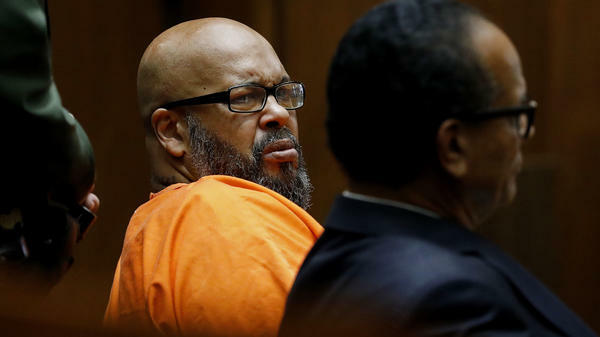 Marion "Suge" Knight faces 28 years in prison after pleading no contest to "running over a man and killing him in a restaurant parking lot three years ago," according to the Los Angeles County District Attorney's Office. Knight, 53, is the co-founder of rap label Death Row Records. He agreed to a plea deal that includes "one count of voluntary manslaughter and admitted a special allegation that he used a deadly weapon, a truck," the DA's office said. Before the agreement, Knight had been facing charges of murder and attempted murder. The charges stem from January of 2015, when, the district attorney's office says, "an altercation occurred outside a Compton restaurant and Knight ran over two men with his truck." The hit-and-run killed Heavyweight Records co-founder Terry Carter, 55, and severely injured filmmaker Cle "Bone" Sloan. As NPR's Andrew Flanagan has reported, "Knight is accused of hitting the two men near the set of the Oscar-winning, 2015 biopic Straight Outta Compton, and has claimed he was attempting to flee the scene because he feared for his safety." At the time, Knight was out on bail in a robbery case; he fled but was later arrested. He's now scheduled to be formally sentenced on Oct. 4. Sentencing guidelines call for Knight to receive 11 years in prison – a term that would be doubled because of an earlier conviction under California's three strikes law, the district attorney's office says. More years would be added to the punishment because the case involves a serious and violent felony and the accusation of using a deadly weapon. The hit-and-run case against Knight has generated several other crimes and prison sentences. In March, two of Knight's former attorneys were indicted on suspicion of attempting to bribe potential witnesses in the case. The pair had tried to manufacture testimony suggesting there were guns at the scene, to support Knight's claim of self-defense. Evidence against the two lawyers included a phone text from Knight's fiancee, Toi-Lin Kelly, who faced charges of her own related to the case. Kelly "was sentenced to three years in jail [in February] for a parole violation," as Andrew reported. "The probation had been granted after she pleaded no contest to selling surveillance footage of Knight's hit-and-run to TMZ for $55,000." As part of Knight's plea deal, charges against him will be dismissed in two other outstanding cases, both dating from 2014. In one, he was indicted for making criminal threats, by threatening Straight Outta Compton director F. Gary Gray. In the other, he was charged with stealing a woman's camera.